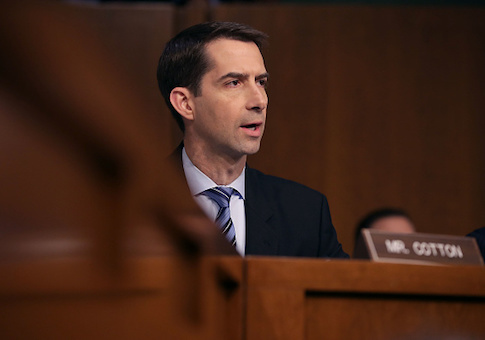 Sen. Tom Cotton (R., Ark.) on Wednesday praised President Donald Trump's decision to approve the sale of lethal defensive weapons to Ukraine. Members of the Trump administration confirmed on Wednesday that the State Department approved a commercial license authorizing the $41.5 million sale of Model M107A1 Sniper Systems, ammunition, and associated accessories to Ukraine, the Washington Post reported. Cotton's office released a statement late Wednesday night praising the decision and saying that Trump is "reminding Vladimir Putin and his cronies that they lost the Cold War." "This is a break from failed Obama era policies to make Russia pay a cost for its aggression," the former Army infantry officer said. "With this decision, the Trump administration is reminding Vladimir Putin and his cronies that they lost the Cold War, and we won’t tolerate their bullying of our friend Ukraine." Congress authorized similar sales in 2014 in the Ukraine Freedom Support Act, but the Obama administration never made a decision to follow through, which was seen as a de facto decision not to provide lethal weapons to the military in Ukrain, according to the Post. Republican Sen. John McCain (Ariz.) sent a letter to Trump back in February urging him to provide lethal defensive aid to Ukraine. In his letter, he asserted that Russia and Russian-backed separatists in Ukraine are "testing" the new administration by launching new attacks. "In the first of what will be many tests for your new administration, Russia and its proxy forces launched attacks against Ukrainian forces this week," McCain wrote in the letter. "That this surge of attacks began the day after he talked with you by phone is a clear indication that Vladimir Putin is moving quickly to test you as commander-in-chief. America's response will have lasting consequences." McCain linked to his statement in response to Trump decision on Wednesday and welcomed Trump's decision to take the "long-overdue step of approving the sale of lethal defensive weapons to help the Ukrainian people defend themselves from Russian aggression." "At every turn, Vladimir Putin has chosen war instead of peace in Ukraine. So long as he makes this choice, the United States and the Free World should give Ukraine what it needs to fight back," McCain said. "I urge the President to authorize additional sales of defensive lethal weapons, including anti-tank munitions, and to fully utilize security assistance funds provided by the Congress to enable Ukraine to defend its sovereignty and territorial integrity," McCain continued. "I also urge the President and congressional leadership to ensure that any budget deal fully supports the $350 million in security assistance for Ukraine authorized by the National Defense Authorization Act signed into law this month." This entry was posted in National Security and tagged Barack Obama, Donald Trump, John McCain, Tom Cotton, Trump Administration, Ukraine. Bookmark the permalink.